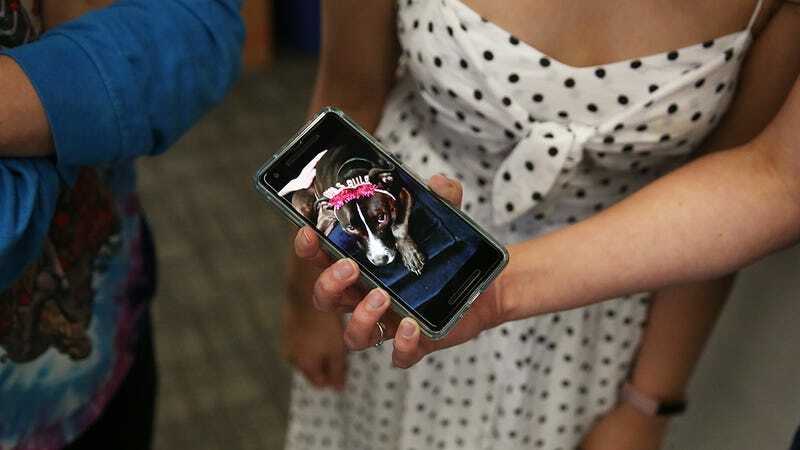 Here’s a story that’s sure to drive you mad with curiosity: This woman won’t loosen her grip on her phone while showing everyone a picture of a dog. Hmm. Seems like she’s doing some real containment work on something here. The woman, identified as 29-year-old Mallory Rainey, is not someone who family and friends would ever suspect of harboring dark or compromising secrets. Yet now, as she shows an amusing photo of her 2-year-old pet cocker spaniel to a group of acquaintances while maintaining an ironclad grip on her phone, you have to wonder if something is up. Every time someone tries to grab the phone for a closer look at the dog, Mallory insists that she’ll just hold it for them, at one point even yanking the phone out of view entirely to conceal the contents of an incoming text. It’s clear that she’s trying to protect some seriously sensitive information, begging the question: What sort of society-toppling information is this master of secrets keeping behind her cocker-spaniel photo? If someone were to scroll through the rest of her photos or take a quick glance at her recent texts, what sort of forbidden wisdom might be uncovered? The intense diligence with which she’s guarding her phone suggests that she may very well be the gatekeeper to some grand, cosmic mystery, but, maddeningly, it seems as if she’s determined to keep the rest of humanity in the dark. This is truly an enigma. The type of information Mallory is guarding is still unknown, but given the clandestine nature of her behavior, it would not be a stretch to assume that the knowledge contained on her iPhone 8 is powerful enough to usher in either a new age of enlightenment or, conversely, something much more terrible—something unthinkable and beyond our comprehension, for which humankind is just not ready. Whatever the case, only one thing is for sure: No one is finding out anything as long as this mysterious woman keeps clutching her phone like that.